The German Championship DKM has seen once again CRG having the upper hand an the rivals thanks to several solid results in the closing round held at the South Garda Karting circuit in Lonato, that has ended with Jorrit Pex taking the victory in KZ2 and Dennis Hauger and Kas Haverkort alike, respectively in OK and OK-Junior. The race in Lonato, that was the debut of the DKM Championship with 170 drivers on track, has been quite tricky due to the weather conditions, but the competitiveness of CRG drivers has been great in all grades. Jorrit Pex claimed his sixth DKM title in KZ2 on CRG-Tm, after winning it for four years running from 2011 to 2014 and then again in 2016. The Dutch driver of CRG Holland has been among the best since qualifying and heats in Lonato, ending third in Race-1 and securing the title one race early in this way. Jorrit Pex closed Race-2 in seventh place, but with the Championship victory firmly in his hands. Among the quickest in KZ2, Jorrit’s younger brother Stan Pex ended the championship in third position, while SRP Racing Team’s Fabian Federer followed him in fourth. Flavio Camponeschi could not make it to the start of this closing round in Lonato, as he is still recovering from the injuries sustained in the recent World Championship in England and ended the DKM campaign in fifth place. His end result made it 4 CRG drivers in the top 5. 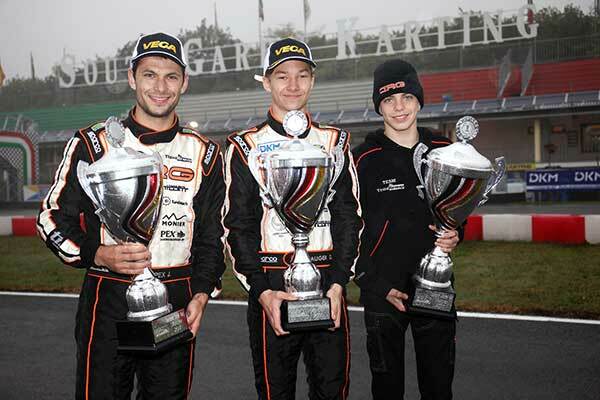 Among the young drivers in force at CRG, Alessandro Giardelli is turning out to very competitive. He has been very quick also in this occasion taking P7 in qualifying and P6 after the heats. The victory of the two finals of Lonato’s closer went to Jeremy Iglesias, who is the runner-up in the championship, and to Matteo Zanchi. 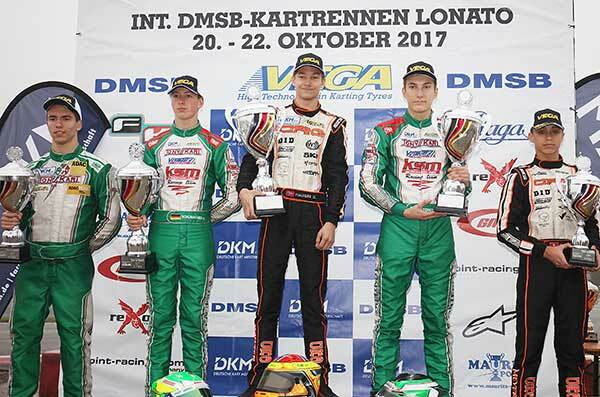 In OK, the Norwegian Dennis Hauger ended his happy experience in karting on CRG-Iame on a high, before switching to car racing next year. Hauger managed to take the championship victory thanks to Race-1’s victory in Lonato, at the end of quite an eventful race. He therefore claimed another DKM title after winning last year’s OK-Junior campaign. Hauger secured the title one race early at the end of Race-1 having the best of his nearest rival David Schumacher, before taking another podium in Race-2 with P5. Hauger has obtained 5 wins in DKM with CRG in this season: one in Kerpen, three in Wackersdorf and the final one in Lonato. Among CRG drivers, Kilian Meyer has been shining taking P7 in Race-1 in his comeback to karting after a wrist injury, while Tim Troger and Michael Rosina also ended Race-2 in the top ten, as they respectively ended ninth and tenth. CRG has secured a good one-two in OK-Junior thanks to the victory of the Dutch Kas Haverkort on CRG-Iame run by CRG Keijzer Racing and the second place taken by Hugo Sasse on CRG-Iame run by CRG TB Racing Team. The final classification of the Championship sees CRG and Zanardi placing 8 chassis by CRG in the top 10 of the final classification. Haverkort arrived in Lonato only one point clear of Sasse, but the fifth place in the first final allowed him to hit the big target, as Sasse could not go beyond the ninth place. The victory of Race-1 went to the French Hadrien David on Zanardi-Iame, while the Swiss Leandro Anderruti won Race-2 on Maranello-TM. Haverkort was second this time around, Sasse seventh, Donar Nils Mundin eighth on Kalì-Kart and David ninth. 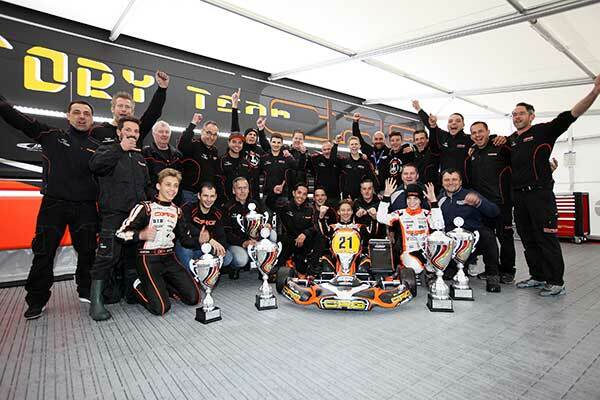 The Dutch driver of CRG Holland Jeroen Bos secured a stunning double win in KZ2 Kart Cup on CRG-TM. These two superb victories placed him on the third position of the Championship. The title was won by the Austrian David Detmers, who took two second places in Lonato and pipped Julian Muller. Among the quickest CRG drivers in Lonato, the French Emilien Denner took a great third place on the wet on Kalì-Kart-TM, in his first race on the wet. He then closed a very tricky Race-2 – due to the rain, in fourth place.